Orlebar Brown "Bulldog" swim trunks featuring jacquard print. Orlebar Brown "Bulldog" style solid swim trunks. Quick-drying fabric. Side slash pockets; back zip pocket. Hem hits above knee. Zip fly/snap front; buckled hip tabs. Nylon. Made in Portugal. Model's measurements: Height, 6'1"/185cm, waist 32"/81cm, suit 40L, shirt 15x34, inseam 32"/81cm. Orlebar Brown swim trunks in bulldog foglia graphic design. Approx. measurements (size 32): 12" rise, 7" inseam, 23" leg opening. Orlebar Brown swim trunks in bulldog foglia graphic design. Approx. measurements (size 32): 12" rise, 7" inseam, 23" leg opening. Shaped waistband. Adjustable metal straps at sides. Rear darts. Hem hits above the knee. Polyester. Made in Portugal. 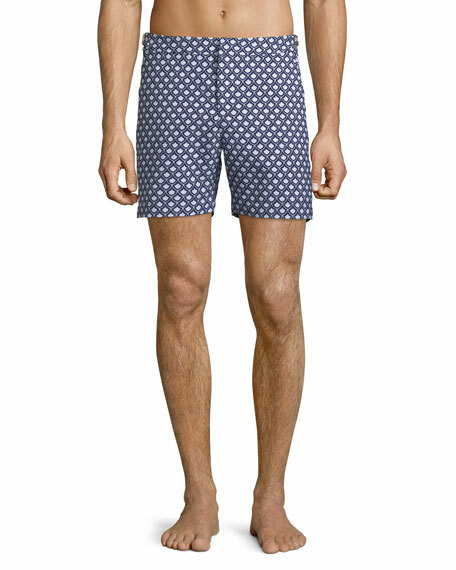 Peter Millar "Sugar Sugar" swim shorts with graphic skull print. Approx. 18" inseam. Side slip pockets; back button flap pocket. 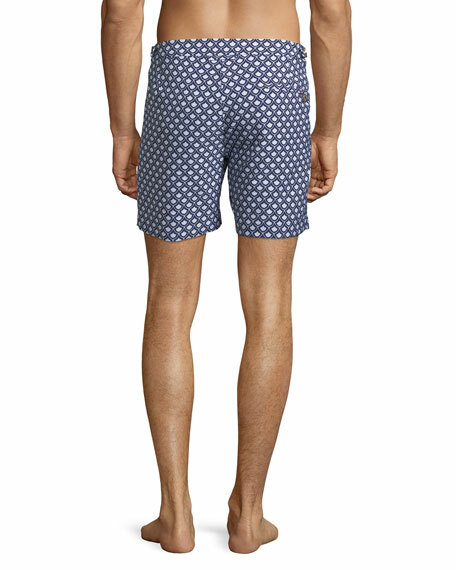 Peter Millar "Sugar Sugar" swim shorts with graphic skull print. Approx. 18" inseam. Side slip pockets; back button flap pocket. Button/zip fly; elastic waistband Polyester. Machine wash. Imported.